Experience involving fieldwork in the Marine science/ Aquaculture/ Chemistry of natural products will be added qualifications. The posts are purely temporary and only for one year duration of the research project. Applications enclosing Biodata, certificates, mark lists and proof of age should reach “Prof. 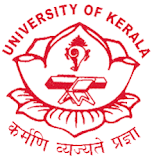 K. Padmakumar, Principal Investigator – DBT Research Project, Centre for Marine Biodiversity, Department of Aquatic Biology and Fisheries, PO Box 30, Kerala University Campus, Kariavattom, Trivandrum–695581” on or before 19 July 2018.